I am not a great vegetable fan. So obviously radish is not something I would like to have in its normal sabji preparation. Recently we had gone for crop picking and radish season was on. We had picked up couple of red radish. I obviously would not enjoy the subji made out of them. So thought of trying out the raddish or mooli paratha. Here we go with the recipe. For this we need the radish in scrapped, grated and all its water drained and water retained separately. 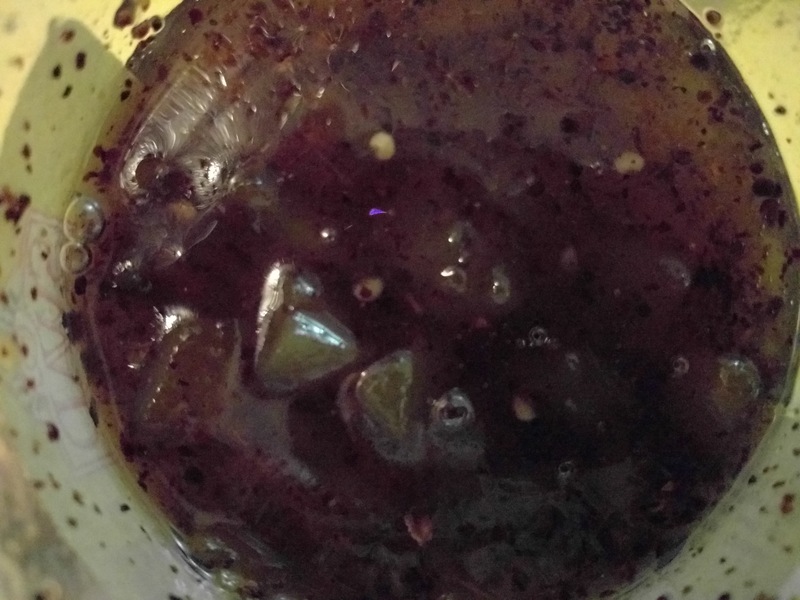 Mix all the ingredients roughly – radish, ginger-garlic paste, carrom seeds. green chilli, red chilli pwd, turmeric pwd, cumin powder, coriander pwd, coriander leaves and salt. To the above add the flour, oil, more salt if required and radish water as required. Incase you need more water to knead th dough apart from the radish water, then you may use. Keep the dough covered with a damp cloth for at least 30 mins. Divide the dough into 12 -15 balls. Roll each into a 1/8 inch thick disc of around 6 inch dia using enough flour as required. Fry over a hot griddle using generous amount of ghee. A year ago, at a family friend’s get together, we all friends were discussing about ice creams. I happened to mention to them that recently I happened to try avocado ice cream. While the discussion was on, one of my friend’s expressed her wish to relish butterscotch ice cream. She told me that if ever you try butterscotch ice cream at home do let me know. I don’t mind driving to your house, for more than two long hours just to relish the ice cream, she said. 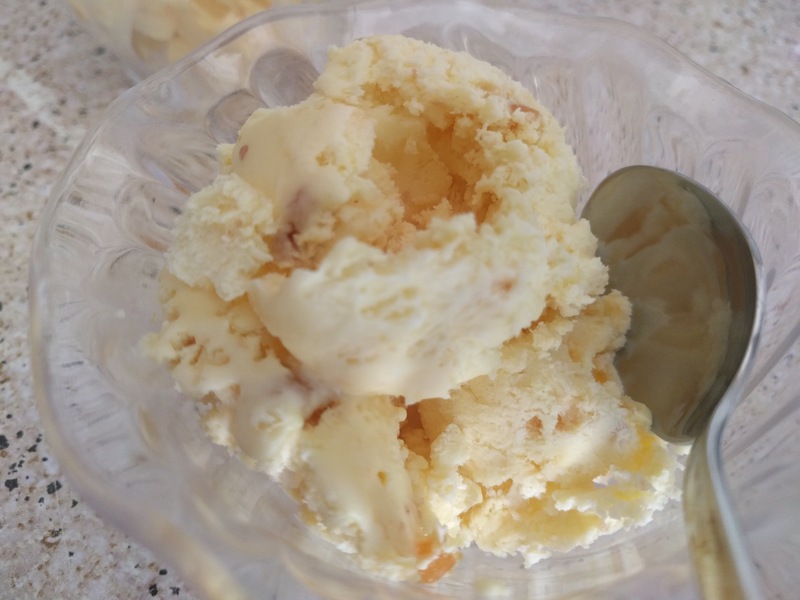 She also mentioned that after coming to US, she tried many butterscotch ice cream but, non gave her that satisfaction that she got after she had any such ice cream back in India. From that day onwards, it always ringed in my mind that I have to try out butterscotch ice cream for this friend of mine. I started exploring various recipes on the internet. Almost, all mentioned the use of butterscotch essence. But to my dismay, butterscotch essence I could not readily find in the US marts around me. I tried arranging it through friends travelling to and fro to India but in vain. Place the bowl (in which you shall beat the cream) and the beater attachment in the freezer at least for half an hour. Heat a pan and once hot caramelize the sugar on low flame stirring continuously. Once caramelized, add the butter and nuts and mix well. Transfer it into the greased plate and spread it in a thin layer on the plate. Allow to cool. Once cooled, remove it by pressing the bottom of plate. Crush the praline into smaller chunks or powder. 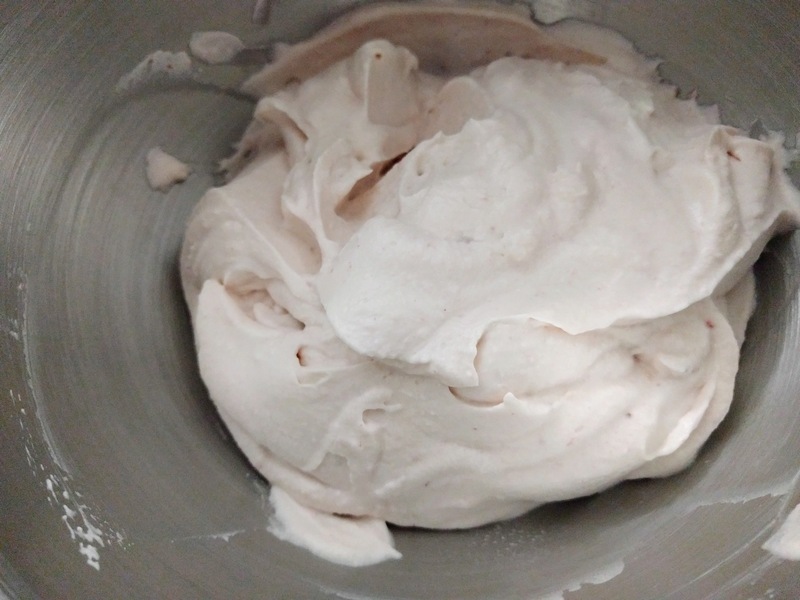 In cooled bowl, beat the whipping cream to stiff peaks. Once double in volume, add the sugar and beat further till well mixed. Then fold in the milk, essence,praline and food color till well incorporated. Reserve some praline for garnish. 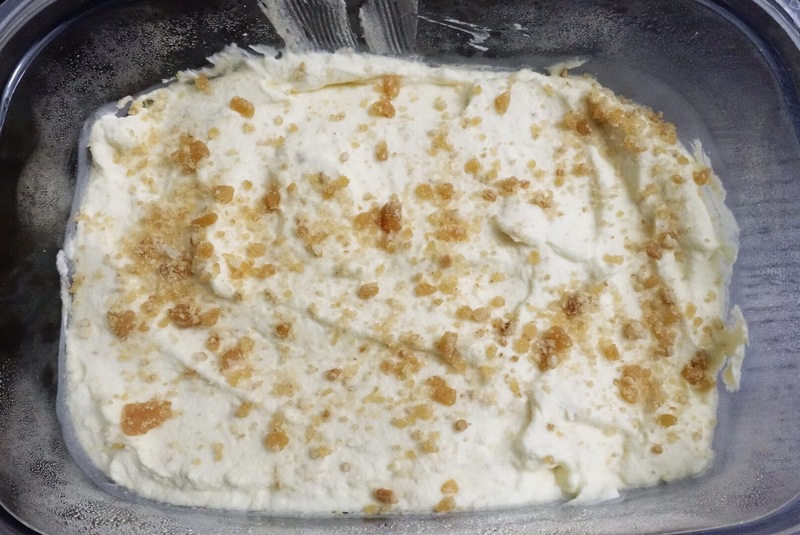 Pour the ice cream in an air tight container and garnish with remaining praline. Allow to set overnight. You can even serve the scoop sprinkling some praline over the scoop. You can also beat the ice cream midway while it is just about to set but not yet set and then allow it to set again. However this is optional. Back in my homeland, as the summer season begins starts the season of stocking up food stuff, preserves, dry fish, spice powders, etc for the upcoming raining and winter seasons that follow the summers. Summers mark the availability of many fruits, one of which is the mangoes. 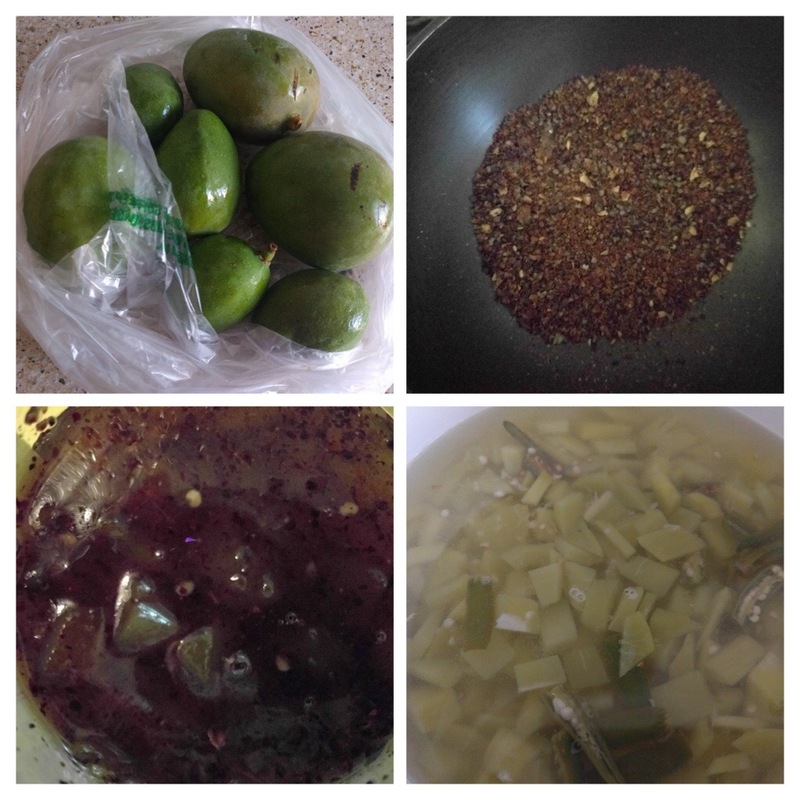 In our native language (Konkani) “Ambli” means raw baby mangoes while “God Lonche” means sweet pickle/preserve. 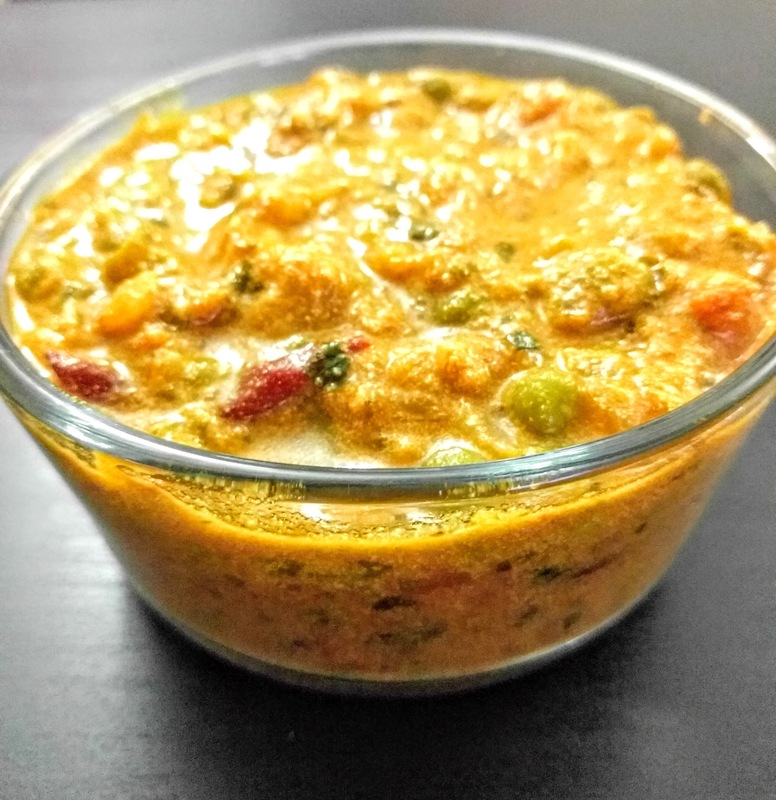 This is very commonly made and preserved dish during the mango season in most of the Goan households. You can just eat it as is like dessert or serve it with chapati or roti (tortilla). 3 medium-sized raw baby mangoes, peeled and cubed or cut into small thin slices. 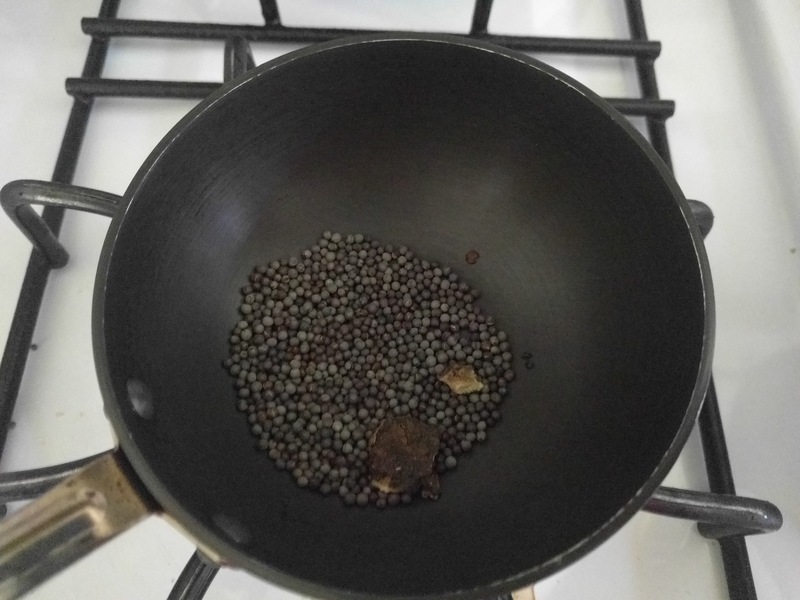 In a small frying pan, dry roast the mustard seeds and hing. Once cooled, roughly powder them using mortar and pestle. 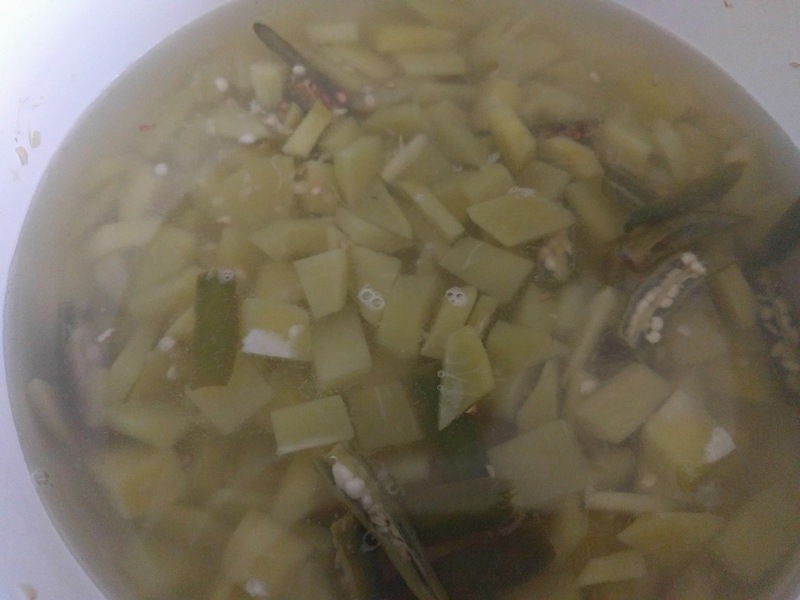 In a saucepan, add the mango pieces, chillies and enough water such that the mango pieces are well covered. Cover and cook till the mango pieces are well cooked. Once cooked, strain the mango and chili pieces and keep aside. 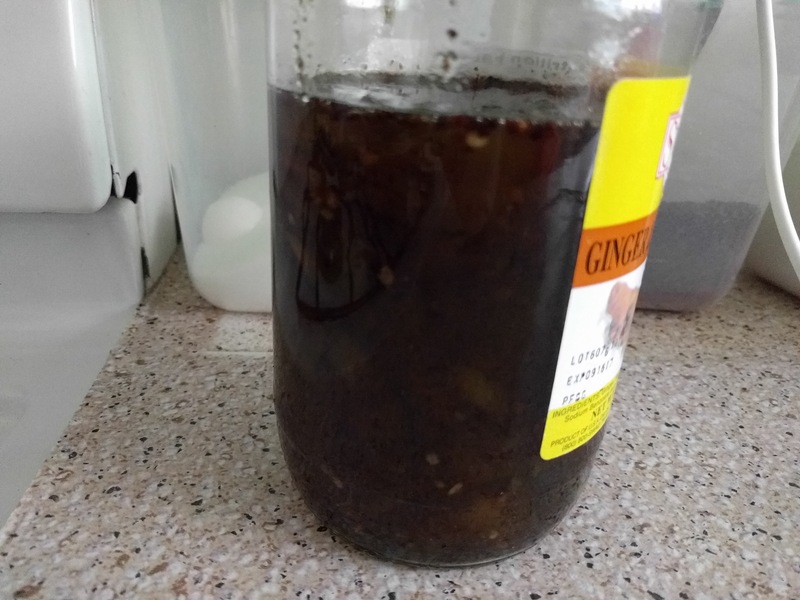 To the residue water, add the jaggery. Start with around 300 g jaggery and then keep increasing as per your sweetness requirement. 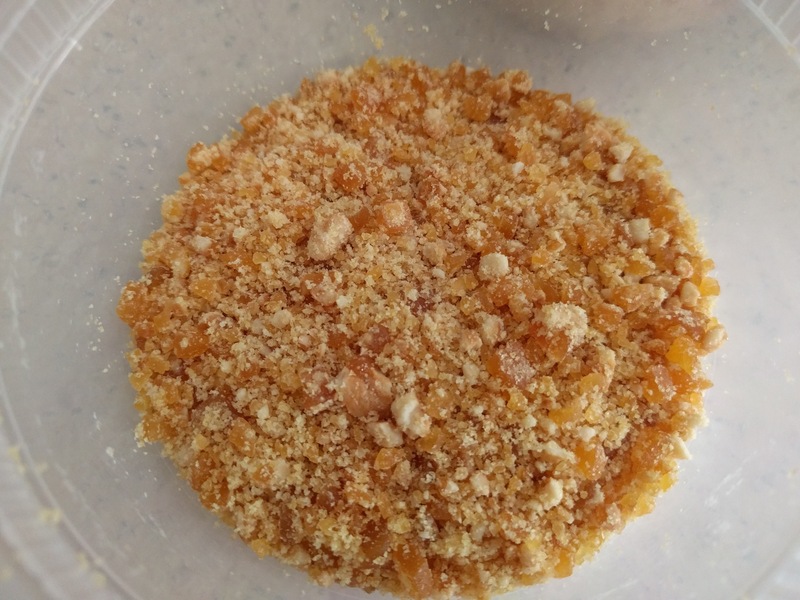 Once the jaggery is well dissolved, add the mango pieces, chillies, salt as per taste and powdered mustard hing mix. Mix well. Cook uncovered till desired consistency is achieved. It should not be too runny nor too thick. Cool and store refrigerated in an air tight container. Bring conserve to room temperature prior to serving and enjoy with roti or chapati. 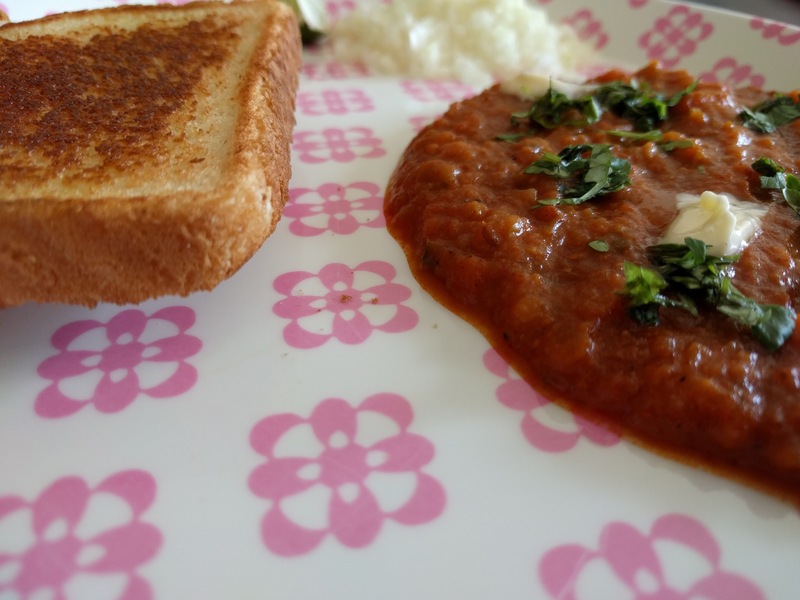 Pav Bhaji has always been an attractive, tempting street food. I always cherished this dish since my childhood. I always liked it with extra butter, cheese. But I have realized not all eateries can make a delicious Mumbai special pav bhaji. 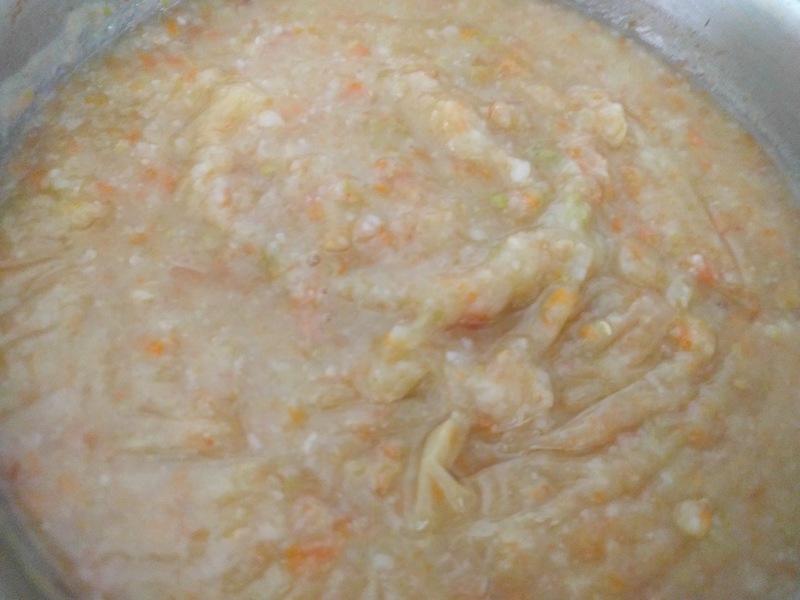 In a pressure cooker, boil potatoes, tomatoes, green peas, cauliflower florets and carrot for 3-4 whistles. Once the pressure is released, remove the boiled vegetables and mash using a potato masher. In a flat bottom pan, melt 4 tbsp butter. 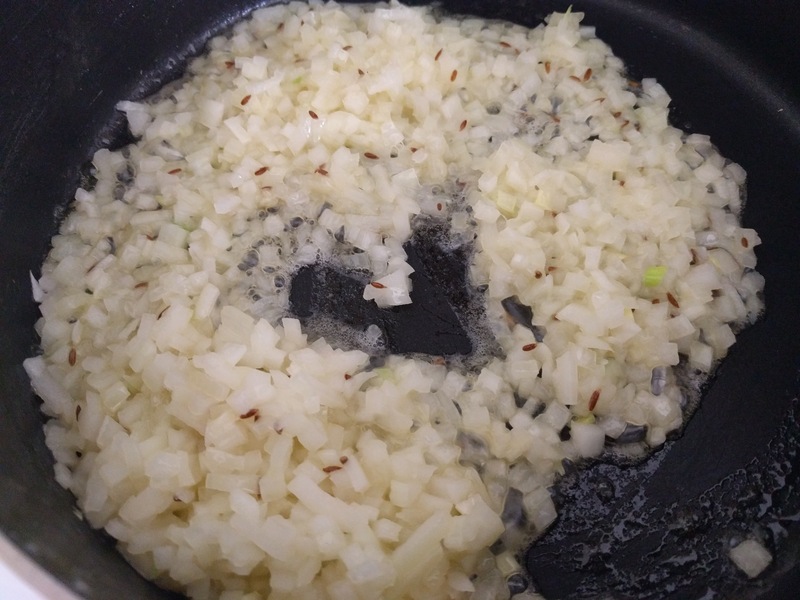 Before it browns, add the onion, cumin seeds and ginger garlic paste. Saute till the rawness of the paste is lost and onions turn transparent. Then add the green pepper and sauté. 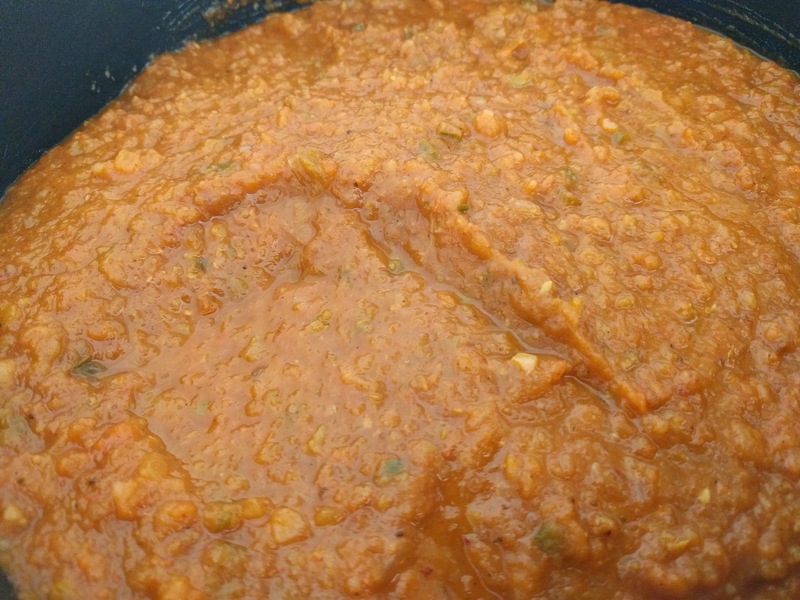 Add the red chilli and pav bhaji powder. Mix well. Add the vegetable mash, mix and add salt as per taste. 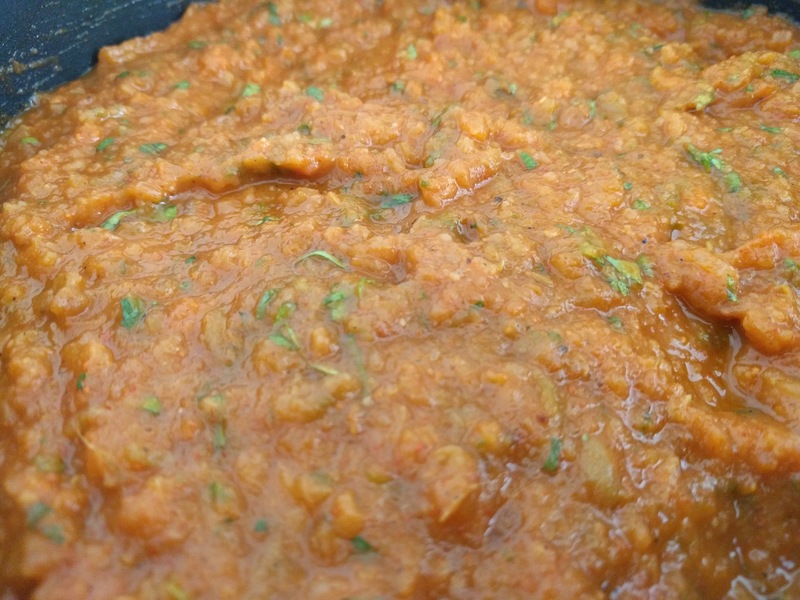 You can also add red food color to impart the street food pav bhaji color. Add a little water to adjust consistency and mash further if required. Bring to a boil and garnish with coriander leaves. You can also add a tbsp of butter and grated cheese (optional). Cut the pav into half, apply butter to all the sides and warm them on a hot griddle till the butter melts. 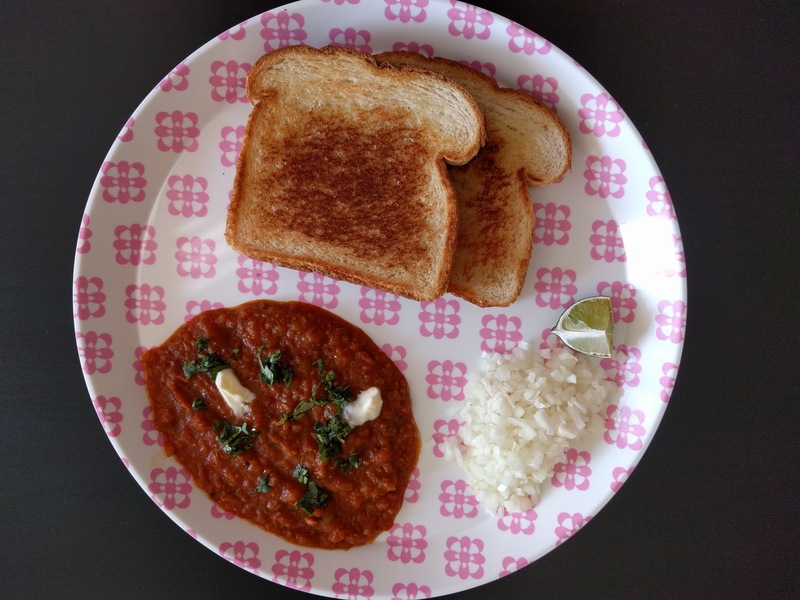 Serve the hot pav bhaji, prepared pav with chopped onion and lemon wedges. Grind the sesame seeds with very little water into a coarse paste. 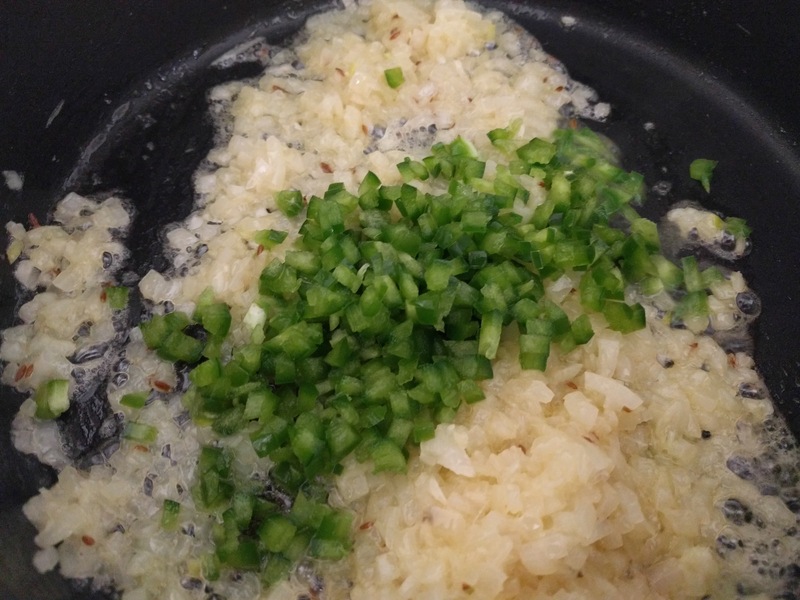 Add the salt, garlic cloves and grind into fine paste by adding oil in batches. 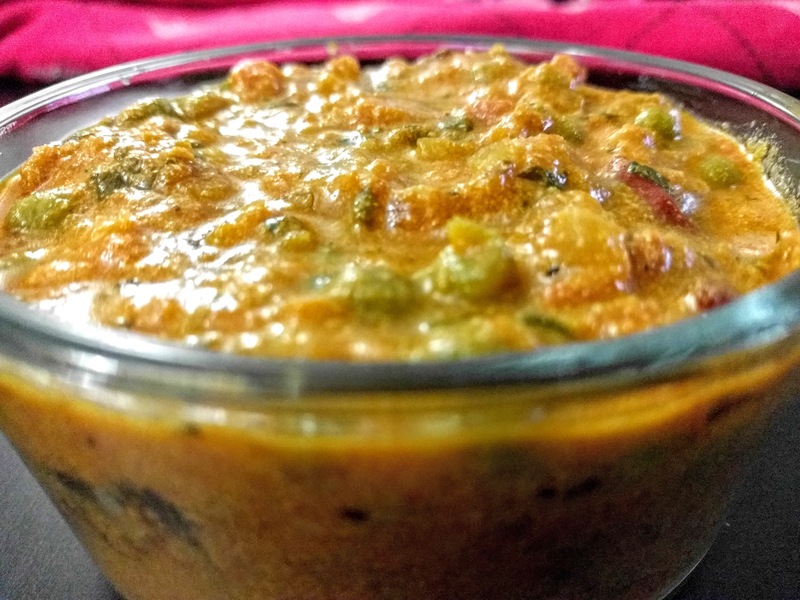 Whenever we visit any pure veg restaurants, we always prefer to order pav bhaji or if roti, then we go for green peas masala. However, this was a case then when we were in India. Nowadays finding an Indian restaurant itself is like finding a pool of water in a desert. Heat oil and ghee in a pan. 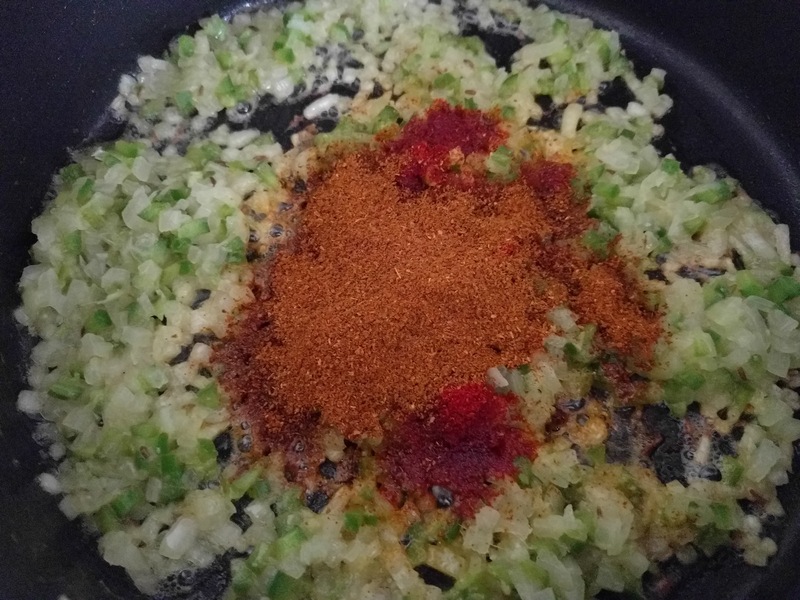 Once hot, add the whole spices – cloves, cinnamon, cardamom, bay leaf and fry for a minute. Then add the onion and sauté till golden brown. Add the green chilies, red chilies and ginger garlic paste. Sauté till the rawness of the paste disappears. Add the tomatoes and allow to cook till mushy. Now add the peas and allow to cook. Next add all the spice powders – turmeric, red chili, cumin, coriander, garam masala, kitchen king masala, black pepper, yoghurt and salt as per taste. Cook till the oil oozes out. Next add 1/2 cup water and cook covered for 5 minutes. 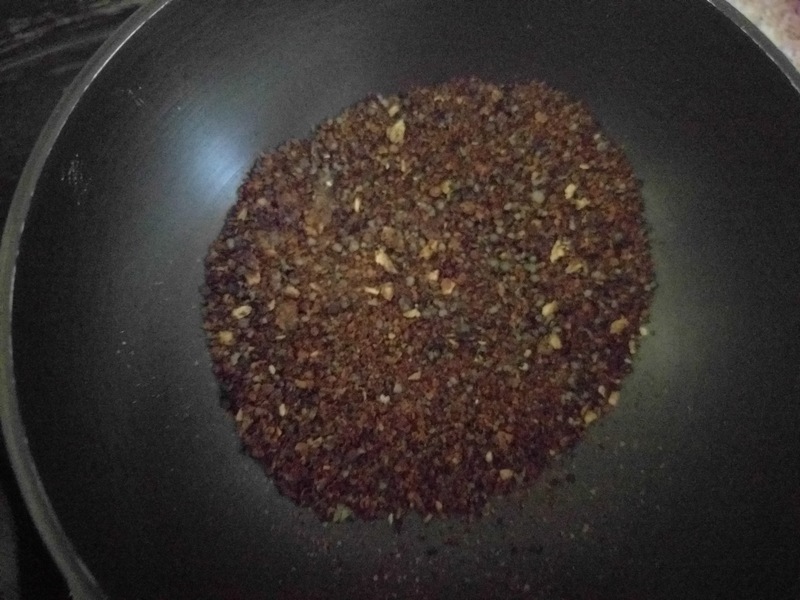 Then remove the lid and cook on medium flame till thick consistency is achieved. Garnish with chopped coriander leaves and server with roti or chapatis. There is this Valentine’s day special contest being held on a food group on facebook from beginning of Feb to 12 Feb 2017. It asks you to prepare any dish but the main ingredient should be strawberry. Me and my hubby we both look up to celebrate Valentine’s Day. We might not celebrate our birthdays or anniversaries but Valentine’s Day is something we look forward to to celebrate or to give each other unique gifts. I guess the reason for this is that we knew each other since college days. I was excited to see the contest announcement but when I read the details further the main ingredient made me skeptical and I was reluctant to participate. 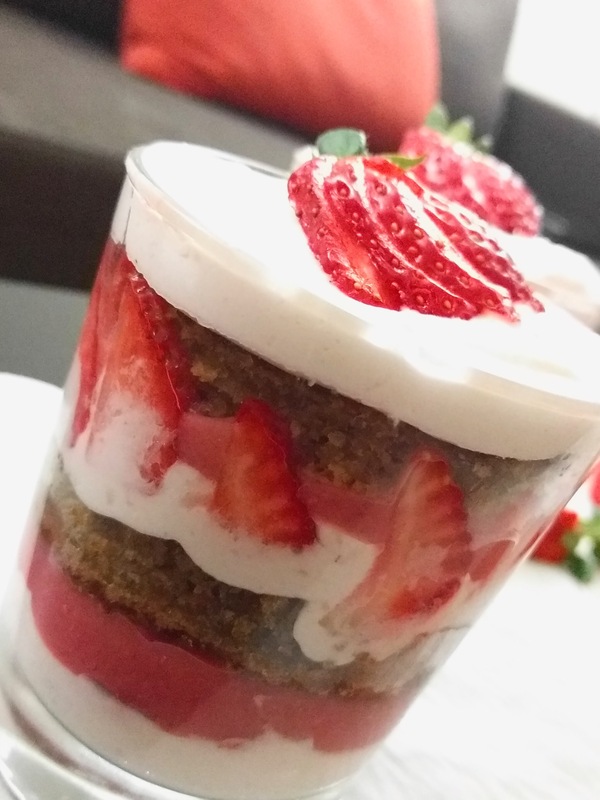 A few days passed and my desire to participate was increasing but every time I gave it a thought I would step back thinking about “strawberry – main ingredient”. The reason is I personally don’t cherish strawberries 😏. And this being valentine’s special my husband I can say hates it. 🙄. Giving this more thought I decided that I should try out something with strawberry that my hubby would at least dare to taste even when I tell him that it’s made using strawberries. And yes let me proudly tell you the attempt and of course the efforts were successful and paid off. 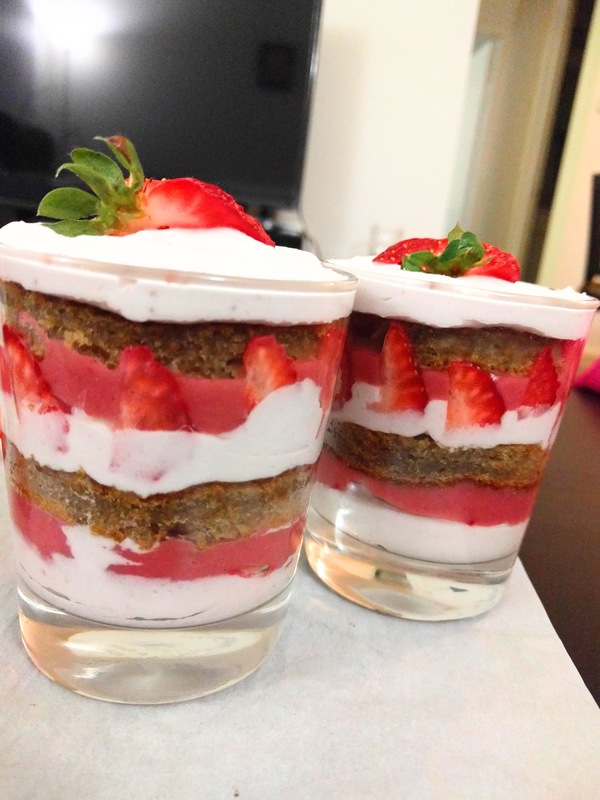 He said ” If you had asked me to eat strawberries just like that I would not have eaten but this dessert that you have made is really good and liked it.” He almost ate half the glass much more than I expected. 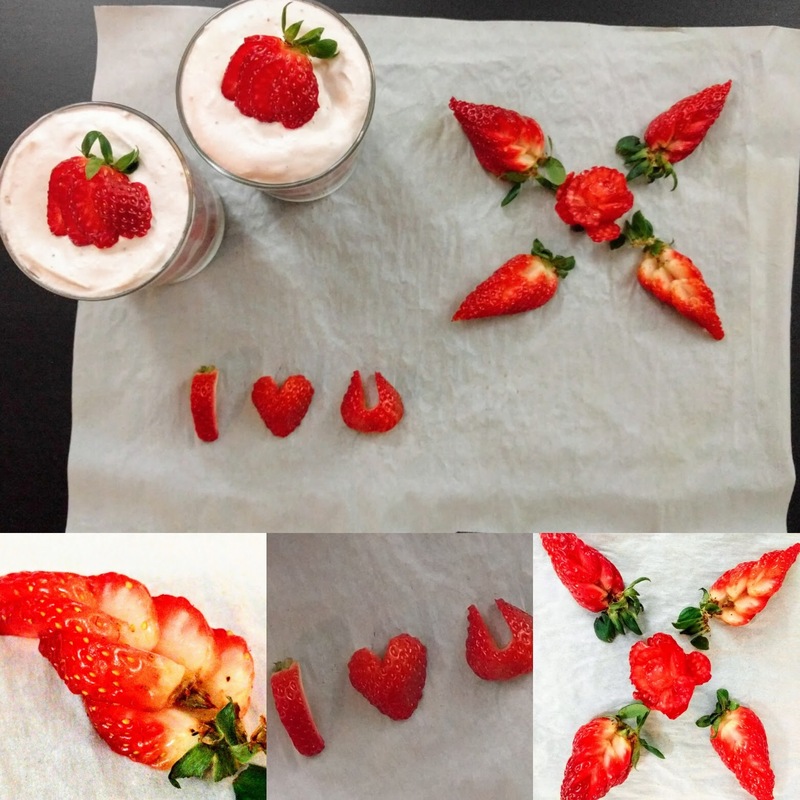 You will need less than 1 kg of strawberries for this entire recipe. 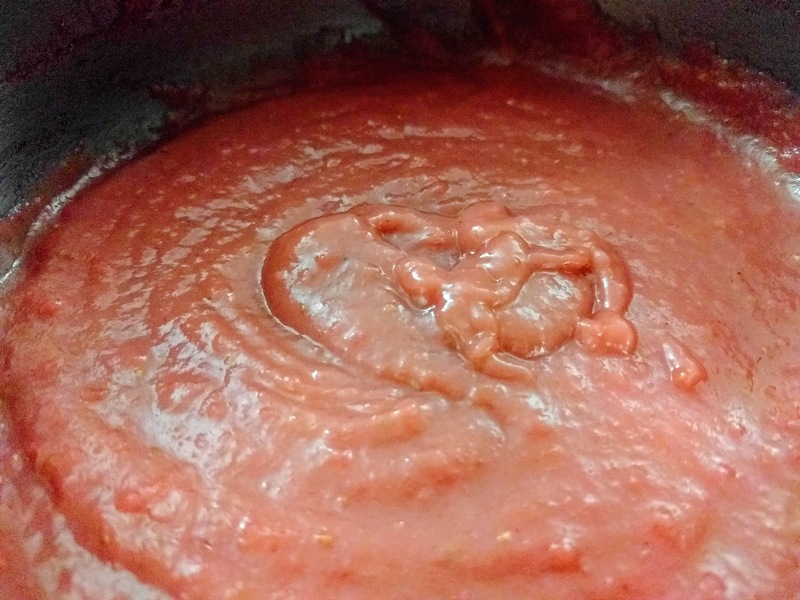 Where ever I have used puree, there I have roughly chopped and pureed the strawberries in a blender, after which I have passed the puree through a sieve. Beat butter with sweetened condensed milk. Sift all purpose flour, baking powder and baking soda into the beaten butter mix. Add strawberry puree. Beat further. Add aerated water or club soda and mix further till all is incorporated. Pour the mixture into a greased and floured sheet pan (9×13 inch) and bake it in an oven preheated at 350F for 30 mins or till done. 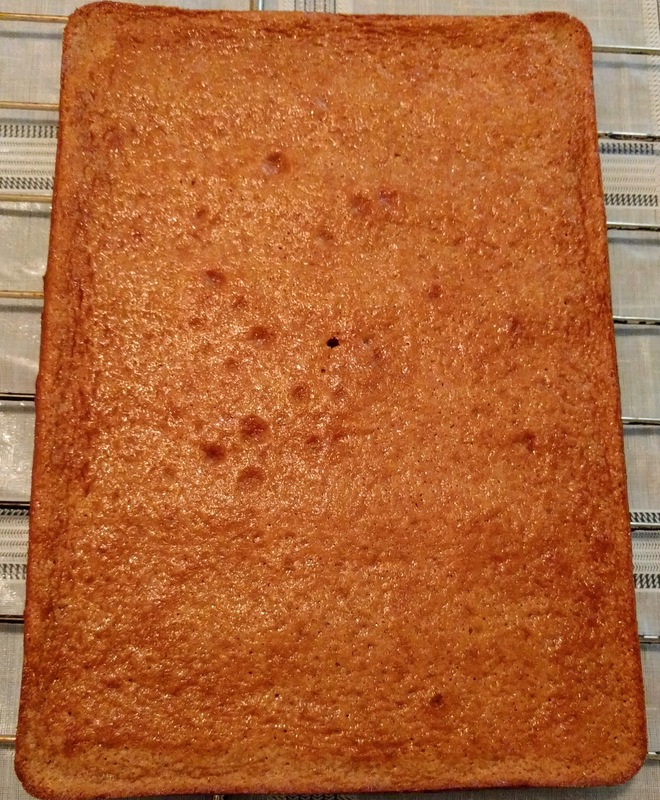 Then allow the cake to completely cool on a cooling rack. In a saucepan, melt butter. In a bowl dilute cornflour in 2 tbsp of prepared puree. Mix granulated sugar in the butter alongwith the remaining puree. Once it boils, stir in the cornflour mix and keep stirring for another 5 mins till well incorporated. Put off the flame and allow to cool. Prior to beginning with this cream preparation, keep the mixing bowl and whip in freezer for 15 mins to cool. 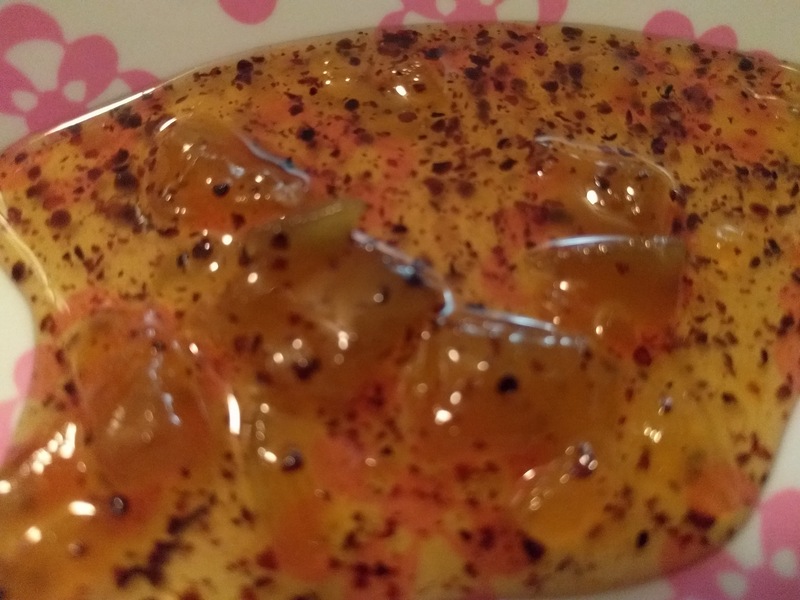 Mix unflavored gelatin in cold water and allow to rest. This mix helps in stabilizing the cream. Then beat heavy whipping cream with vanilla extract until soft peaks are formed. 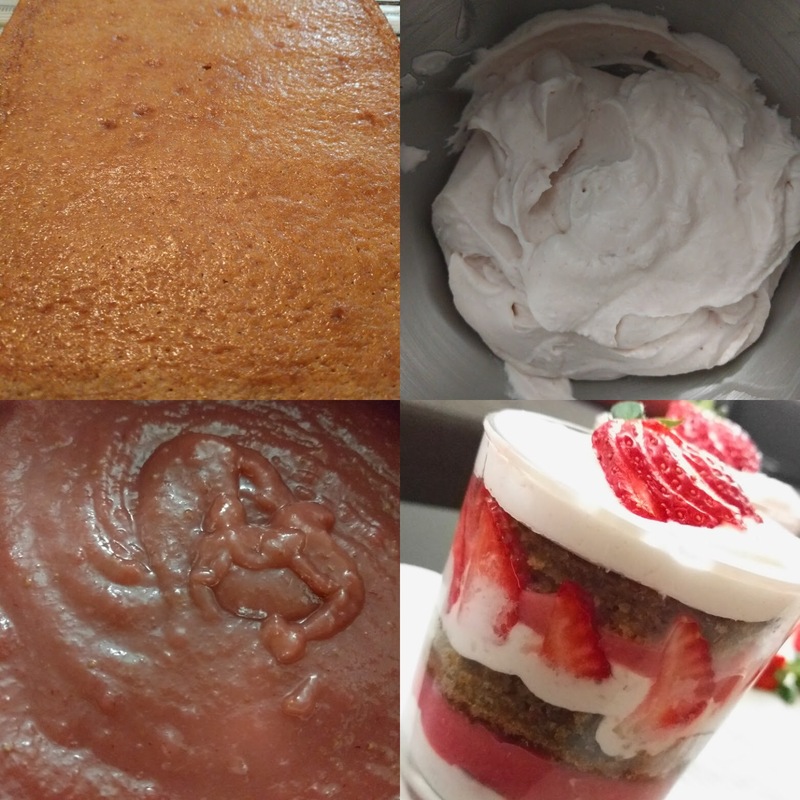 Fold in confectionery sugar, strained gelatin mix and strawberry puree and beat again till stiff peaks are formed. You can use a serving dish or individual dessert cups for the assembly. Chop and slice few strawberries. I used a round cookie cutter to cut circular cake discs. I could get around 12 discs. Take a glass. Spread a layer of cream, then a layer of chopped strawberries followed by layer of sauce and then cake followed by a layer of cream. You can either stop here and garnish with strawberry slices or you can repeat another stack as shown in picture with chopped strawberries, sauce, cake and again cream. The final layer always needs to be cream just before garnish. Single stack prepares 12 serves while if double stack is set up prepares 6 serves.